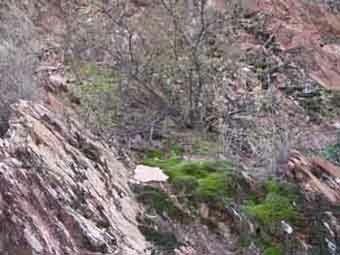 Note: this page is an initial sketch. Suggestions are welcome. 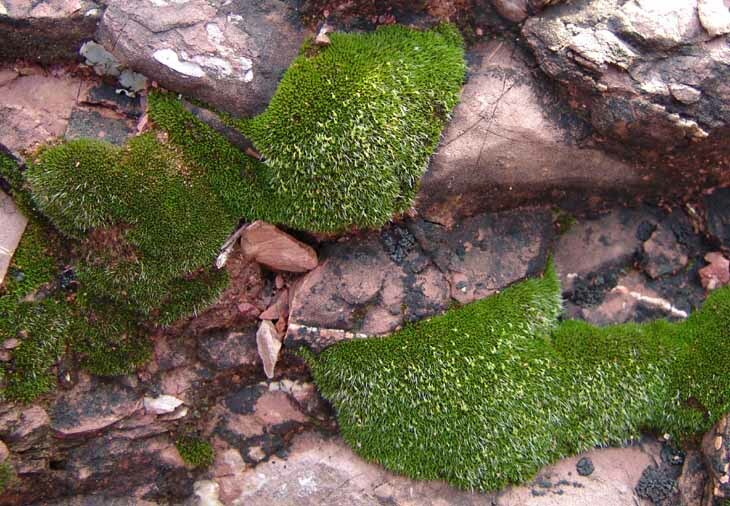 Bryophytes are non-vascular plants -- they lack vascular tissues (xylem and phloem) for internal water conduction and support -- thus lack true roots, stems, or leaves -- as well as skin protection (cuticle), and they must therefore depend on their immediate surroundings for necessary moisture. They reproduce sexually by forming male or female reproductive structures, wherein the sperm must swim to the egg in order to form a zygote. 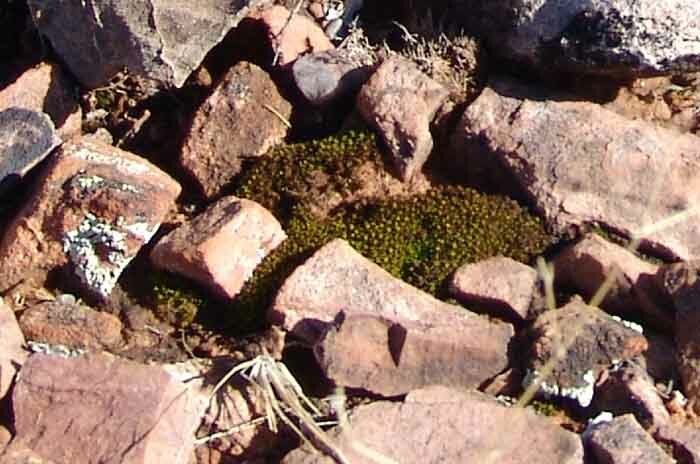 While one might think mosses would be rare in our Arizona Uplands of the Sonoran Desert, we actually find them in quite a number of locations, and in considerable numbers. 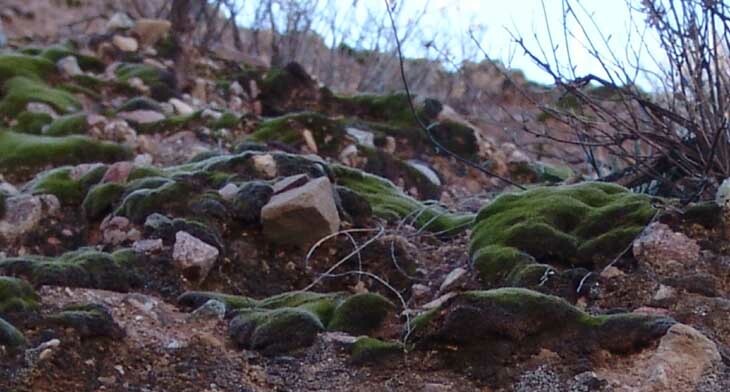 The key is winter shade (which means fairly steep north-facing slopes) and -- of course -- occasional moisture. 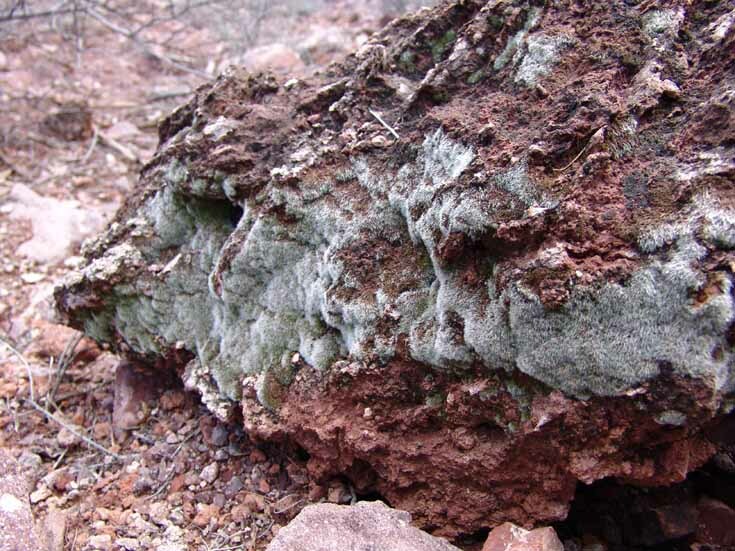 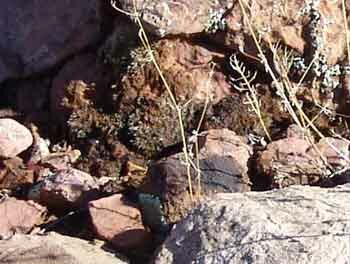 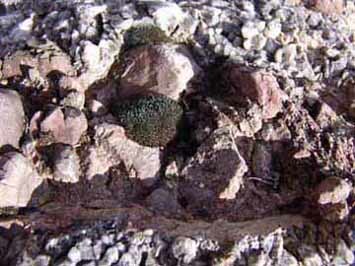 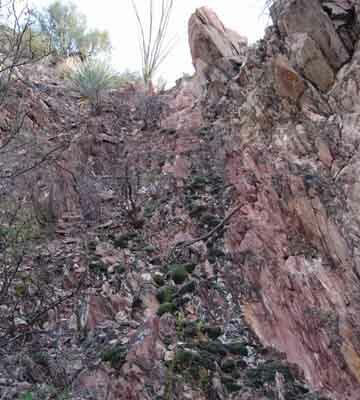 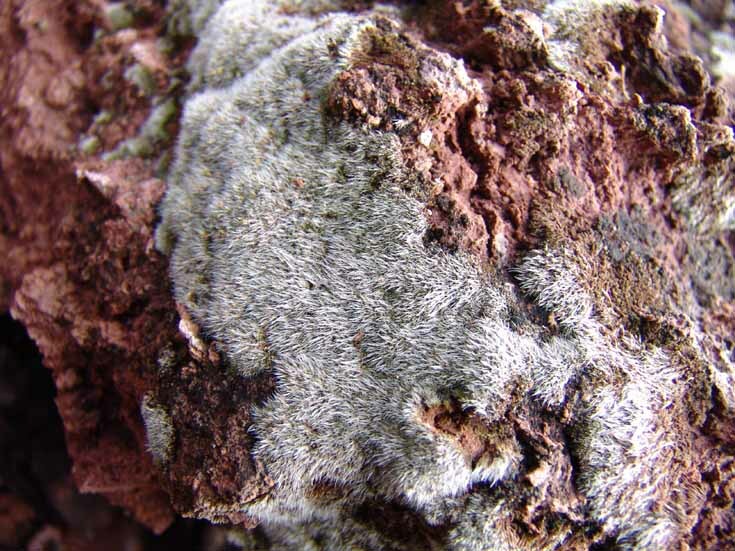 This dark green moss at the left was seen in February 2004 in a protected side-canyon near Jim's Willow Spring (in Cascabel Formation bed-rock). 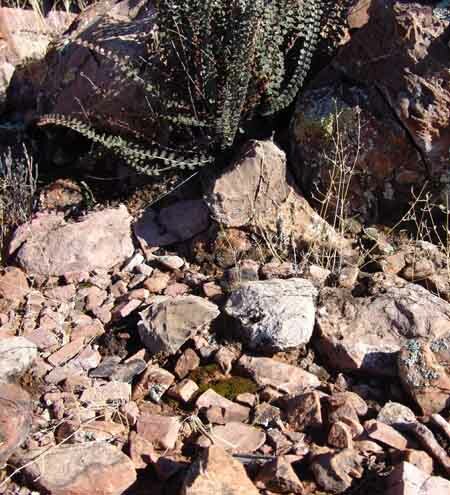 It was in a fairly flat and open space, getting considerable sun, and was somewhat dry, which may have affected its coloring. 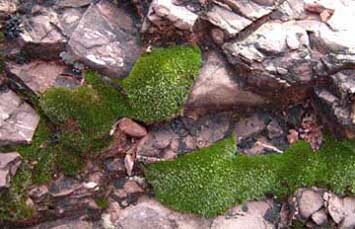 This bright-green moss below was photographed in the Willow Canyon Formation near the Red Trail of Upper Hot Springs Canyon in early March 2004, just after considerable rainfall. 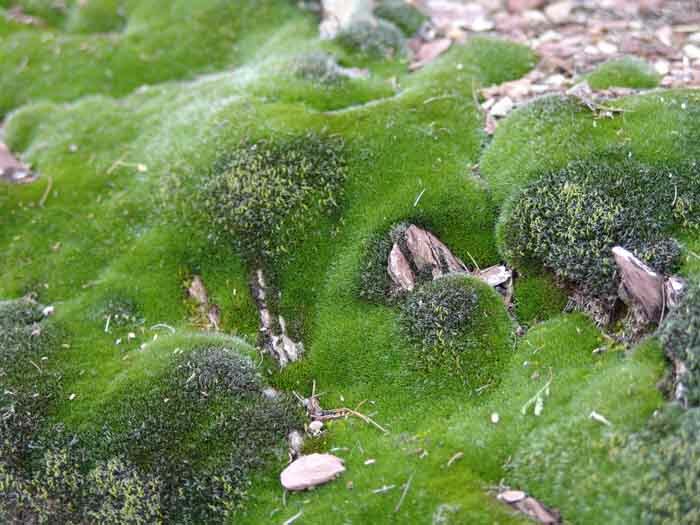 The mosses were damp with moisture. 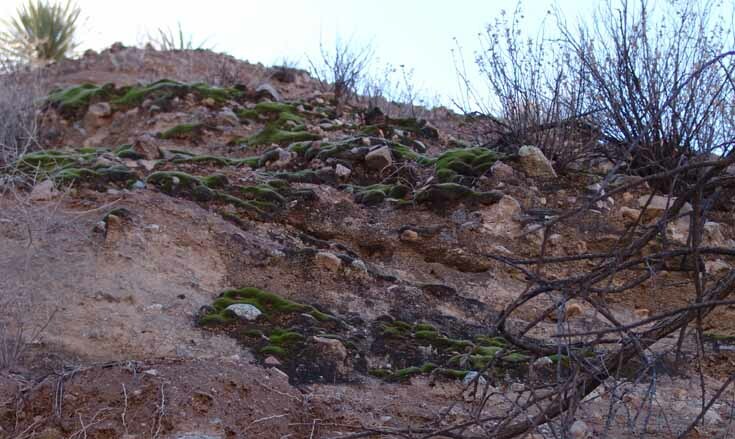 We photographed these mosses below at the end of December 2004, on the hill above the Old Hunters Camp on Willow Canyon geological Formation where we find the unusual "Sun Ferns" (genus Cheilanthes) shown at the top of the photo. 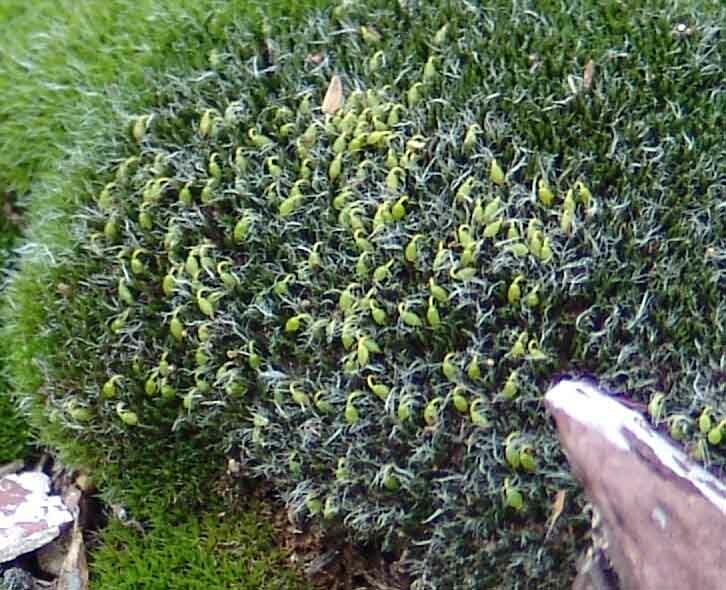 The sun was falling directly on these plants at the time. The lower set on the right appears to have caught considerable moisture from our December rains in this area, and may be actively forming reproductive structures.